Researchers have made an important breakthrough in the use of continuous flow microreactors to produce thin film absorbers for solar cells - an innovative technology that could significantly reduce the cost of solar energy devices and reduce material waste. The advance was just reported in Current Applied Physics, a professional journal, by engineers from Oregon State University and Yeungnam University in Korea. This is one of the first demonstrations that this type of technology, which is safer, faster and more economical than previous chemical solution approaches, could be used to continuously and rapidly deposit thin film absorbers for solar cells from such compounds as copper indium diselenide. Previous approaches to use this compound - which is one of the leading photovoltaic alternatives to silicon-based solar energy devices - have depended on methods such as sputtering, evaporation, and electrodeposition. Those processes can be time-consuming, or require expensive vacuum systems or exotic chemicals that raise production costs. Chemical bath deposition is a low-cost deposition technique that was developed more than a century ago. It is normally performed as a batch process, but changes in the growth solution over time make it difficult to control thickness. The depletion of reactants also limits the achievable thickness. The technology invented at Oregon State University to deposit "nanostructure films" on various surfaces in a continuous flow microreactor, however, addresses some of these issues and makes the use of this process more commercially practical. A patent has been applied for on this approach, officials said. "We've now demonstrated that this system can produce thin-film solar absorbers on a glass substrate in a short time, and that's quite significant," said Chih-hung Chang, an associate professor in the OSU School of Chemical, Biological and Environmental Engineering. "That's the first time this has been done with this new technique." Further work is still needed on process control, testing of the finished solar cell, improving its efficiency to rival that of vacuum-based technology, and scaling up the process to a commercial application, Chang said. Of some interest, researchers said, is that thin-film solar cells produced by applications such as this could ultimately be used in the creation of solar energy roofing systems. Conceptually, instead of adding solar panels on top of the roof of a residential or industrial building, the solar panel itself would become the roof, eliminating such traditional approaches as plywood and shingles. 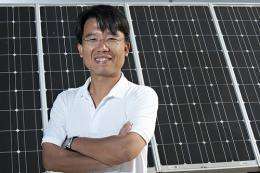 "If we could produce roofing products that cost-effectively produced solar energy at the same time, that would be a game changer," Chang said. "Thin film solar cells are one way that might work. All solar applications are ultimately a function of efficiency, cost and environmental safety, and these products might offer all of that." The research has been supported by the Process and Reaction Engineering Program of the National Science Foundation. Related technology was also developed recently at OSU using nanostructure films as coatings for eyeglasses, which may cost less and work better than existing approaches. In that case, they would help capture more light, reduce glare and also reduce exposure to ultraviolet light. Scientists believe applications in cameras and other types of lenses are also possible. More work such as this is expected to emerge from the new Oregon Process Innovation Center for Sustainable Solar Cell Manufacturing, a $2.7 million initiative based at OSU that will include the efforts of about 20 faculty from OSU, the University of Oregon, Portland State University and the Pacific Northwest National Laboratory. Organizers of that initiative say they are aiming for "a revolution in solar cell processing and manufacturing" that might drop costs by as much as 50 percent while being more environmentally sensitive. In the process, they hope to create new jobs and industries in the Pacific Northwest. The advancements in solar cell development seem to be making huge strides everyday! I think it is great that there is a sort of competition going on to see which of these types of solar cell will turn out to be the best and most efficient. My money is gonna be on this new type of solar cell I recently saw in a video online. Military scientists have developed a solar cell using nanotechnology that is not only thin, flexible and cheap but 10,000 times more efficient! I'll post a link to the video if you would like to see it for yourself. It's a pretty amazing breakthrough. 10,000 times more efficient than what? Manufacturing process? Surely not voltage/watt output. I tried Googling it, but could not find any specifics. Do you have a link that gives specifics or when they might be available for purchase or the output specs? The only problem I can see with this, and similar tech, is the over-reliance on rare materials. If a way can be found to manufacture them using common elements, like iron, for instance, then we will indeed be crossing home base. Let's keep our fingers crossed on that one. In the mean time, all of the other elements of design, manufacture, and application seem to be falling into place. These kinds of materials could ultimately be integrated into the structural design of almost everything, and eliminate, or at least reduce, the need for batteries or other standby/supplemental power sources for portable/mobile devices or mechanisms, and at the same time allow for self-powered dwellings, and buildings in general -not to mention streetlights, signage- you name it. The 10,000 times more efficient is for Titanium dioxide solar cells, which are less efficient than silicon solar cells to begin with, so the 10,000 times increase makes more sense. For something to be 10,000 times more efficient, the original would have had to be at maximum 0.01% efficient. No solar technology is that bad (and I find it hard to believe that _any_ technology is that wasteful). Actually, particle accelerators are even more wasteful. TeV is rougly a billionth of a joule. Keeping all the equipment juiced to get some TeV's has an extremely low efficiency. The article leaves out the important information--efficiency, anticipated cost per watt, time to market. The glass substrate mentioned may be a deal killer, since you would need a second glass covering to protect the front. Also, how does this compare to efforts by Nanosolar and First Solar who both have efficient deposition processes and hold costs under $1/watt?